This shimmering, brush-on powder creates a soft, warm pink glow. Works well with neutral and pink blush shades. To apply: Sweep the Face Blender Brush through all five shades of Shimmer Brick Compact and dust lightly on cheekbones after blush. Focus on applying shimmer on the top of cheekbones – where light naturally hits the face – for the most flattering look. This provides a really pretty rosy glow to anywhere you place the highlight. I have several shimmer bricks, and pink quartz is my favorite. I use it as a blush topper and it works so well with my NC25 complexion! the highlighter mixed in with the blush gives it such a beautiful, radiant, glowing from within type look. This is beautiful on the skin! It just a flawless highlighter and it can be used as a blush topper! beautiful highlighter that doubles as an eyeshadow palette. lovely palette to use on pale skin tones. This leaves a beautiful finish as a blush topper but I would rather use just a blush and highlight than this. I don't like the texture, it's hard and rough. If you can get past that you may like this. The Bobbi Brown shimmer bricks are so beautiful in the pan. I'm not crazy about them unfortunately due to the hard, sandpaper-like texture. If they were soft I would probably be obsessed because they translate beautifully to the cheeks. 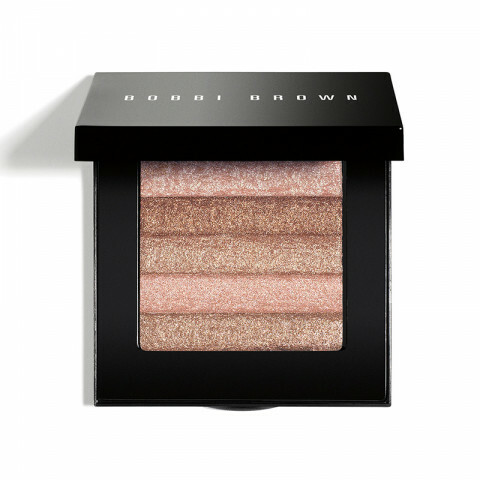 this shimmer brick from bobbi brown is my holy grail! beautiful on pale skin and gives a from within glow. not too shimmery and wears really well during day or night. Gives the perfect pink highlight to the skin. Great application and leaves the skin with a natural, but noticeable glow. Love!